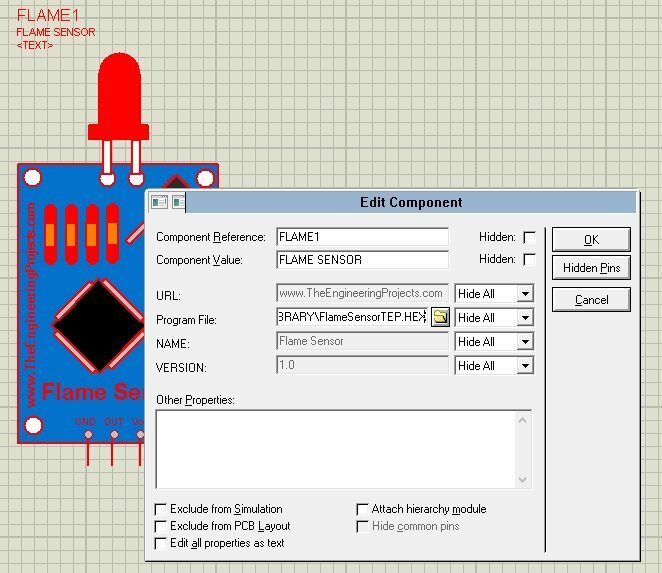 A complete step by step tutorial on Flame Sensor Library for Proteus. Hello friends, I hope you all are fine and having fun with your lives. In today’s tutorial, I am gonna share a new Flame Sensor Library for Proteus. 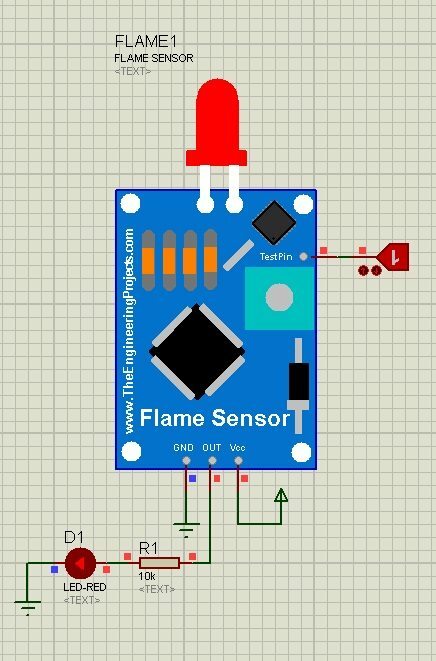 This Flame Sensor is not available in Proteus and its library is not yet developed anywhere. We are the first one designing this new Flame Sensor Library for the first time. I am quite excited while sharing it as its our team efforts that we are able to design new Proteus Libraries which are helpful for students. We are planning to share more sensors’ libraries this week. I hope you guys are gonna enjoy them and share it with your friends so that they can also know about it. Other bloggers are warmly welcome to share this library on their blogs but do mention our blog link in it as a favor. 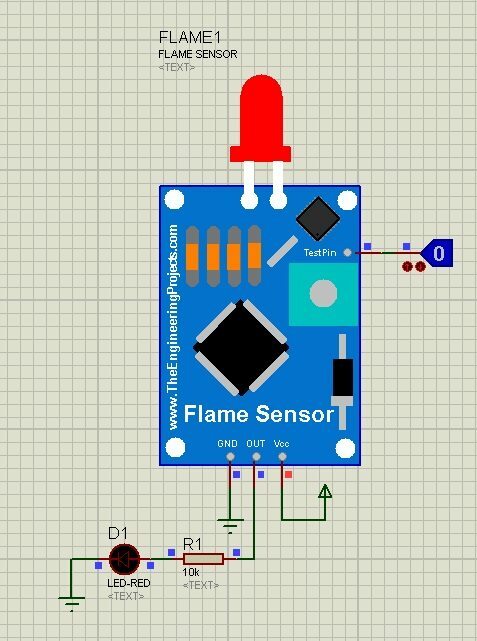 As this flame sensor is concerned, you can also interface it with any Microcontroller like Arduino, 8051 Microcontroller, PIC Microcontroller etc. It is also use in Embedded Systems Projects especially related to security. If you have any questions, then ask in the comments. 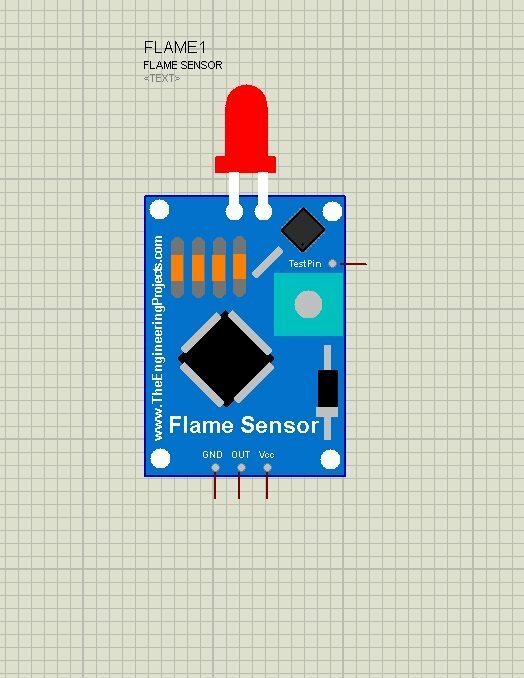 In this next tutorial, I will show you How to interface this Flame Sensor with Arduino in Proteus ISIS. So, now let’s get started with this new Flame Sensor Library for Proteus. Once you downloaded the file, extract it. Now post the libraries files in the Library folder of your Proteus software. If you are using Proteus 7 Professional, then you should have a look at How to add new Library in Proteus 8 Professional. The Flame sensor is shown in the above figure, it has four pins on it. One of them is Vcc on which you need to give +5V. Other one is GND which you need to ground. Third one is OUT pin, which will turn HIGH when this Flame sensor will sense flame. Fourth pin on the side is the TestPin, when it goes HIGH it means the sensor has sensed flame. So, that’s why we are using TestPin and when you make this pin HIGH, it will be like sensor is sensing the Flame and it will give HIGH signal on your output. You should also have a look at these Arduino Projects for Beginners. After uploading the Hex file now click OK and your sensor is ready to be used. Now you can see I have applied +5V on Vcc and GND on GND. I have attached a logic state on TestPin, now as the logic state is 0 means no flame detected by flame sensor, that’s why OUT pin is zero and LED is off. Now you can see in the above figure that as I clicked the button the LED goes HIGH. This example simulation is also given in the above file. You should also interface it with different Microcontrollers like Arduino, 8051 Microcontroller, PIC Microcontroller etc. So, that’s all for today. I hope you have enjoyed this Flame Sensor Library for Proteus. If you are new to Embedded Systems then you should first read this Arduino Tutorial for Beginners. Let me know your suggestions about this amazing Proteus Library. Thanks. I like the library a lot really needed that for my project. the only thing I feel should be worked on is the component size on Proteus is very big.